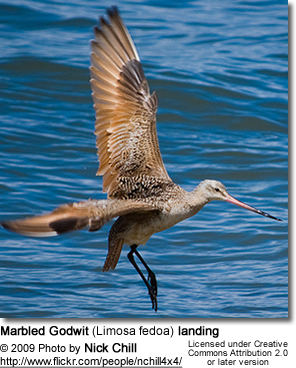 The godwits are a group of large, long-billed, long-legged and strongly migratory wading birds of the genus Limosa. They form large flocks on coasts and estuaries in winter. 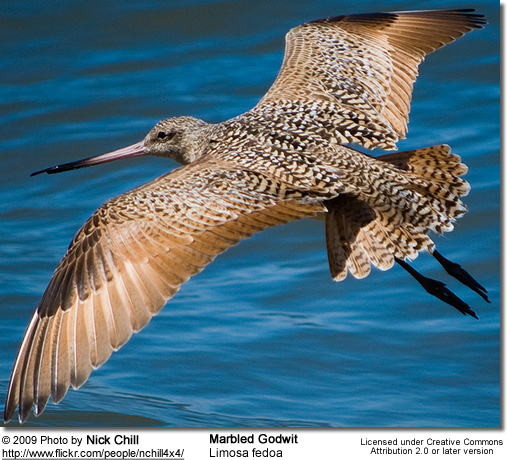 Godwits frequent tidal shorelines, breeding in northern climates in summer and migrating south in winter. In their winter range, they flock together where food is plentiful. 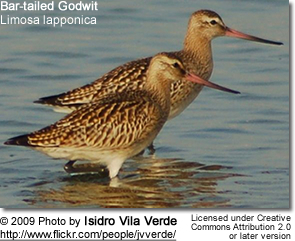 Godwits are shore birds (family Scolopacidae), large sandpipers with long legs and bills. Their long, subtly upcurved bills allow them to probe deeply in the sand for aquatic worms and mollusks. The winter plumages are fairly drab, but three species have reddish underparts when breeding. The females are appreciably larger than the males. They can be distinguished from the curlews by their straight or slightly upturned bills, and from the dowitchers by their longer legs. Bar-tailed Godwit, Limosa lapponica - A female Bar-tailed Godwit holds the record for the longest non-stop flight for a land bird. 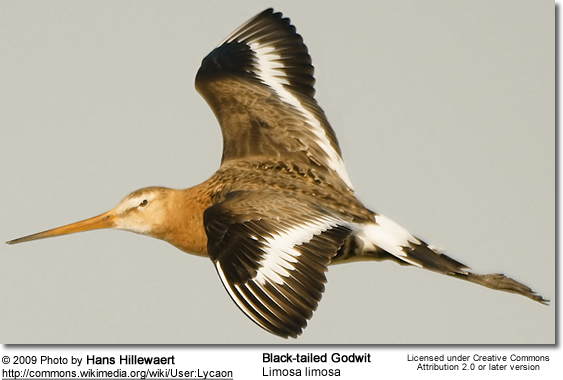 In addition, there are two or 3 species of fossil prehistoric godwits. Limosa vanrossemi is known from the Monterey Formation (Late Miocene, approx. 6 mya) of Lompoc, USA. Limosa lacrimosa is known from the Early Pliocene of Western Mongolia (Kurochkin, 1985). Limosa gypsorum of the Late Eocene (Montmartre Formation, some 35 mya) of France may have actually been a curlew or some bird ancestral to both curlews and godwits (and possibly other Scolopacidae), or even a rail, being placed in the monotypic genus Montirallus by some (Olson, 1985). 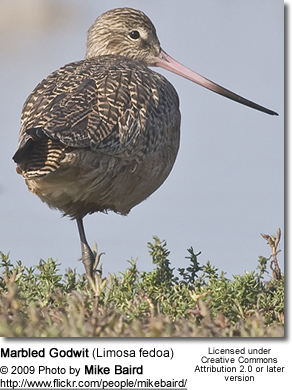 Certainly, curlews and godwits are rather ancient and in some respects primitive lineages of scolopacids (Thomas et al., 2004), further complicating the assignment of such possibly basal forms.